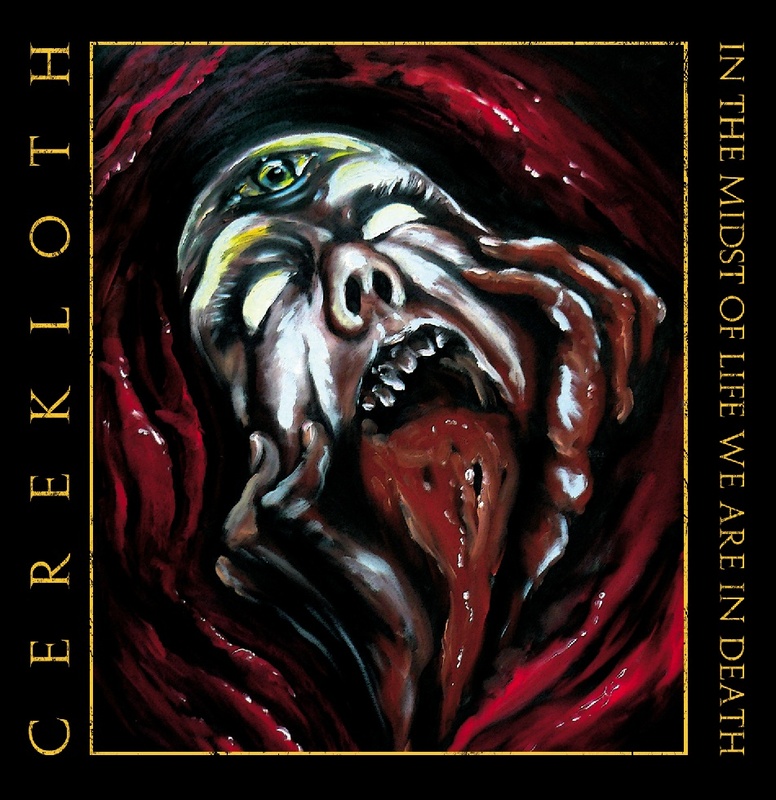 We have Jayaprakash Satyamurthy reviewing Cerekloth’s new LP ‘In the Midst of Life we are in Death‘, released via Hells Headbangers Records. Cerekloth draws from the more deliberate, doomy side of the classic death metal sound. Autopsy, Cianide, some Obituary – these are obvious reference points. So you know from the outset not to expect blinding speeds and technicality. What counts is whether Cerekloth have the songs to sustain the atmosphere they’re trying to create. On the evidence of their first full-length, they do. ‘Halo of Syringes’ was previously released on an EP, and it’s easily the centerpiece of this album. The massive, purposeful sound conjures up an atmosphere of inescapable desolation. The vocals, a little like early Chuck or Reifert, add to the nightmarish vibe. The questing, ominous melodies and layers remind me a little of Ulcerate as well. The album opener, ‘Preludium/Born of the World’ begins with a long, sludgy instrumental in which half-glimpsed melodies seem to weave in and out of a haze of distorted guitars. The tension slowly builds, ably assisted by the rhythm section, and about three minutes into this track, we’re firmly in slow, doomy death metal territory. Once again, I have to mention how apropos the melodies on this album are. Melody, glibly taken to be an absolute good and hastily added to the generic bag of tricks, has been the downfall of large numbers of modern metal acts, in my opinion. Tunes that would not be out of place on an ABBA record or at a polka revival, with ruddy-cheeked accordion players in their hordes and big-bosomed dancers in dirndls in attendance, are somehow passed off as metal and blared out to clueless fans who mosh along blissfully and imagine they’re actually into heavy music. Those aren’t the kind of melodies Cerekloth deals in; instead, they take us back to Slayer in their heyday, to Autopsy at their most morbid, dealing out melodies that unnerve and forebode. ‘Mesmerising Holy Death’ is another standout track, living up to its title. Steady, implacable drums support a sluggish, misanthropic riff. Deep, guttural vocals gurgle out what are no doubt horrific tales through a song that keeps threatening to roar into full-speed mayhem, but instead builds the suspense by retaining its moderate pace while hinting at a release of power to come. Instead, there’s a long, flowing solo with a strangely watery tone that manages not to sound out of place at all. Cerekloth may not be working in the most original idiom, but they’re still here to play by their own rules. Other highlights include the epic album closer, ‘The Reaper’s Instant Is Our Eternity’ and the riffing on ’Within The Hollow Crown’. The vocals are consistently strong throughout the album, never just a generic grunt but a twisted, gut wrenching wordstew that adds palpably to the impact of each song. The drum work is tight and sure, varying between a half-time feel and mid-tempo blasting, but the real stars here are the guitarist who have a massive, funebreal tone and the tunes to match.